A Stagnant Weather Pattern Will Give Way to More Cool Weather for the Eastern U.S.
You didn't think winter would go down without a fight, did you? The stagnant weather pattern that's blanketed the United States this week is finally giving way and will be replaced by a pattern that will allow frequent shots of below-normal temperatures to dip across the eastern two-thirds of the United States over the next week. The pattern we've seen in the upper levels of the atmosphere resembled an omega block, which occurs when a stationary ridge of high pressure over the middle of North America is bookended by low-pressure systems on the western and eastern sides of the continent. An omega block leads to warm, calm weather in the center of the United States and Canada with unsettled weather on either coast. The blocking pattern we experienced last week kept moving—albeit very slowly. This sluggishness allowed persistent showers and thunderstorms to develop over the southern half of the country, where flash flooding and severe thunderstorms were a serious issue for several days, especially across Texas and Louisiana. Some areas in Louisiana and Texas saw flash flooding from more than eight inches of rain from heavy rain thunderstorms training over the same spots for several days. Unfortunately, the most plentiful rainfall missed the areas hardest-hit by drought over the past few months. 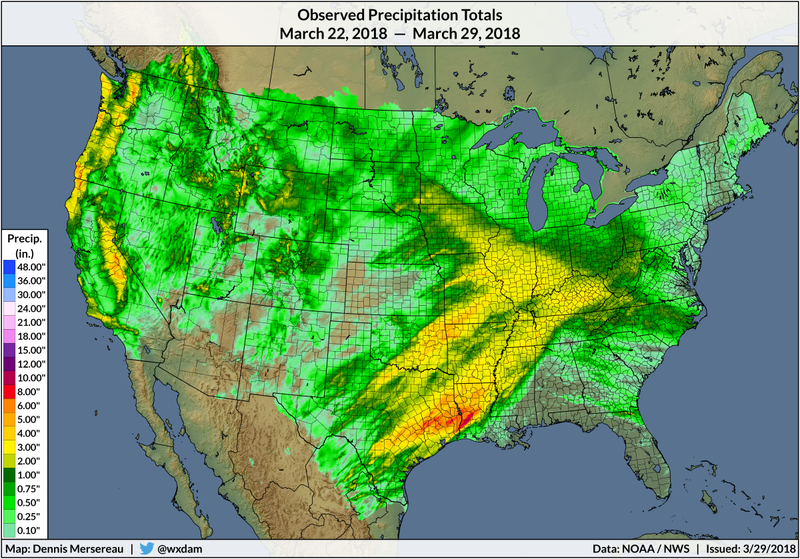 Areas that saw more than an inch of rain almost completely avoided parts of the country that are in some level of drought. What can we expect over the next few days? Temperatures for most of us east of the Rockies will follow one of those classic, springtime up-down-up-down trends as storms and disturbances come and go. The Climate Prediction Center shows below-average temperatures for most of us east of the Rockies, while above-average temperatures and dry conditions continue for the western section of the country. Snow should mostly be relegated to the Rockies and the northern states, where a fast-hitting winter storm could drop up to eight inches of snow in Minnesota and Wisconsin on Friday and Saturday. There's a quick chance of snow or a wintry mix from Sunday into Monday from the central Plains through the Mid-Atlantic, but it shouldn't amount to much if it snows at all. The sun angle is high enough this time of year that wintry precipitation won't stick around very long if it accumulates at all. Our next chances at significant weather should emerge toward the middle and end of next week, when heavy rain and thunderstorms are possible along and east of the Mississippi River, and a potential heavy rain event could welcome the first weekend of April for parts of the West Coast. The Weather Channel is under new ownership. The Hollywood Reporter published news on Thursday that Entertainment Studios recently closed a nine-figure deal to buy the Atlanta-based weather behemoth away from Comcast, NBC, and the venture capital firms that have owned the network for the past ten years. Knowing how media companies changing hands tends to lead to changes, I decided to greet the news by writing an open letter to the folks at Entertainment Studios with the hope that they fully understand the power of their new acquisition. Congratulations on your recent purchase. You now own one of the most powerful platforms for safety information and science education in the United States. The Weather Channel has been a cornerstone of the weather community since 1982 and its reach has saved and changed countless lives across its decades on the air. The spark that energizes The Weather Channel is unlike anything that goes into any other project on television. It's one of a rare group of networks whose sole mission at its inception was to serve its viewers. They're not there just to tell you about the weather. These dedicated meteorologists—some of whom have been in front of the camera longer than I've been alive—are there to explain what's going on and help their audience stay safe. True weather coverage is service journalism in a world that increasingly needs it. I grew up on The Weather Channel. I was the geeky 8-year-old who set the VCR to record segments of Weather Center during the day so I could watch it after school. I looked up to the meteorologists who explained the weather to me every day. The late Dave Schwartz's quirky sense of humor and friendly presentation style had a lasting effect on my own sense of humor and how I approach writing and speaking to audiences. One of the highlights of my childhood was the day I got to stand in The Weather Channel's parking lot while visiting family in Atlanta. 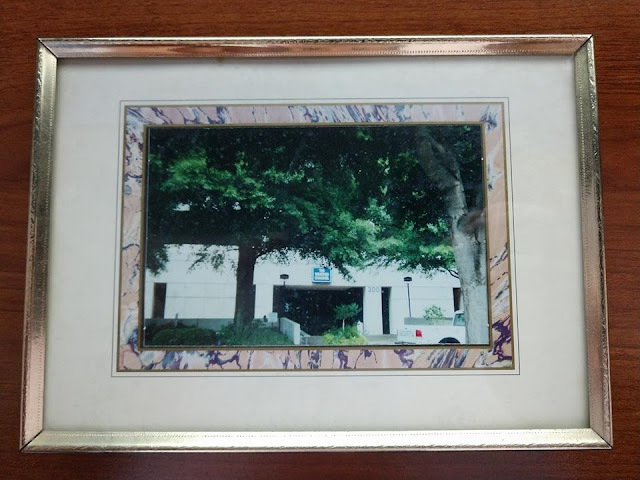 The picture I took that afternoon is still in its frame 18 years later. My story is far from unique. It would be hard to come across a meteorologist, an aspiring student, or a weather enthusiast of any age in the United States who wasn't inspired by The Weather Channel. That says nothing of the countless lives saved by the network's devoted coverage of severe weather events. I know people who religiously hinge on every word spoken by Dr. Greg Forbes and Carl Parker and Jim Cantore because their voices were the voices folks heard while they took refuge from storms raging around them. The rapport The Weather Channel's experts have built with their viewers is immeasurable in terms of its value. Trust is a crucial component of how people respond to severe weather. I've written quite a bit about The Weather Channel over the years. Not all of it was flattering. I strongly disagree with the network's winter storm naming practices. It's a betrayal of the network's mission that there's no actual weather on the air between the hours of 8:00 PM and 5:00 AM during the week and only a dozen hours of weather coverage during the weekends. I've lost count of how many times I've wanted to get information about bad weather only to find fat guys peeing in the woods or angry truckers cussing at each other instead of, y'know, the weather. My criticism of the network comes from my love for what it's done and what it can still do. And there's no other network on television that would engage with critics as frequently and openly as The Weather Channel. The network's winter weather expert had an open exchange with me several years ago on a blog post I wrote criticizing winter storm names. They even allowed—heck, encouraged!—me to speak my mind about my disagreements with the channel when I appeared as Dr. Marshall Shepherd's guest on an October 2015 episode of WxGeeks. Things have gotten better since then, but Comcast/NBC's ownership left a lasting mark on the network through hours and hours of reality programming each day. The allure of reality programs to keep the lights on and turn a profit is understandable—that's the whole point of running a business, after all—but The Weather Channel spent decades positioning itself as the leader in weather. The network has a unique responsibility as the leading source of weather information on television to continue providing timely information and analysis to its viewers. Any further expansion of entertainment programming will betray this trust. The smartphone revolution changed the way most of us get our weather information. Most of us now have a personal emergency alert system in our pocket wherever we go. We also have more apps than we know what to do with, and many of those apps pull weather information from questionable sources. But the smartphone revolution isn't all for the best. Apps alone cannot tell the whole story. Knowing the high and the low and a cute cloud emoji is okay at a glance, but most weather events take more than a passing look to understand what's going on. You can't get the full story on a major snowstorm on the East Coast or tornadoes in Alabama or potential flooding or fires in the West just by looking at two numbers and an emoji. The weather requires nuance and an expert explanation of what's going on. We need details. Most television and web editors don't care much about the nuances of weather anymore. People are missing key points about weather forecasts and then they get upset when they think the forecast was wrong or they found themselves unprepared for what was to come. That void is why I started this blog. That's why it's so disheartening to see so much reality programming on The Weather Channel. That's why it's scary to think of what can happen to this important network in the future. There are already too many information vacuums when it comes to the weather. We can't afford one more on television. I'm looking forward to seeing what Entertainment Studios will do with this crucial platform going forward. I hope they stay true to the network's core mission of keeping its viewers informed and safe. as lightning zaps around him was an instant classic. But you have to be in just the right place at the right time to see it. Thundersnow can occur in nor'easters and lake effect snow. There's often so much lift created by the dynamics of a powerful nor'easter that this lift can have the same effect as air rising on a warm day. The strong lifting motion leads to convection which allows lightning and thunder to accompany heavy snow. Lightning is also possible during lake effect snow since the snow bands coming off the lakes form through similar processes that generate pop-up thunderstorms during the warm months. The thundersleet we saw in parts of North Carolina and extreme southern Virginia formed through a different process. A typical thunderstorm forms as a result of warm air rising from the surface. Air rises more quickly when there's a large temperature difference between the lower levels and the upper levels of the atmosphere. The speed at which air rises determines the strength of a thunderstorm. A temperature inversion can stop air from rising from the surface. An inversion occurs when a warm layer of air forms on top of a cooler layer of air. 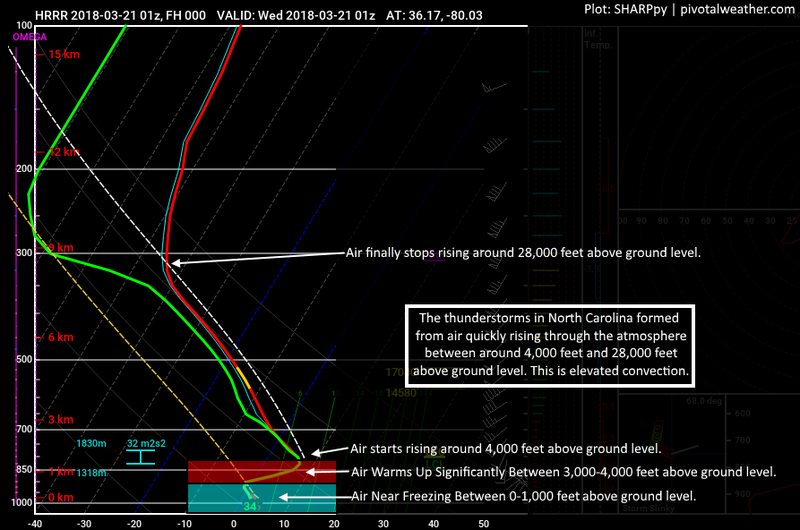 The surface temperature north of Greensboro, North Carolina, on Tuesday night was 35°F when the line of thunderstorms swept through, but the air just a few thousand feet above ground level was nearly 50°F. It was too cold near the ground for surface-based convection to occur. The atmosphere is much more complicated than the simple diagrams they teach us in school. Air doesn't always have to rise from the surface for a thunderstorm to develop. 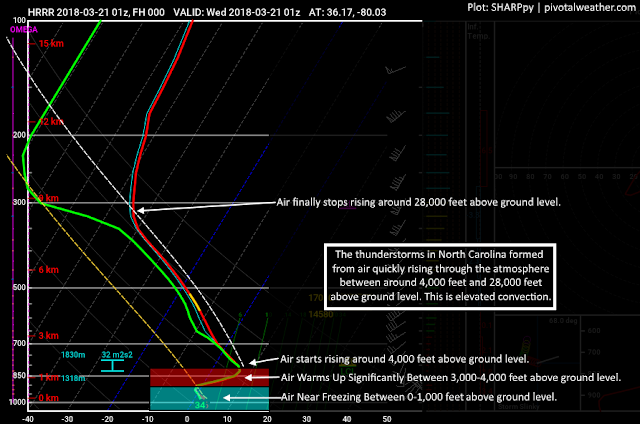 Air can actually start rising from thousands of feet above the surface if the inversion layer is warm enough. The above SKEW-T chart was generated by the HRRR weather model for Greensboro, North Carolina, at 9:00 PM on Tuesday, right around the time the line of storms rolled through the area. The data shows that the air temperature at the surface was around 35°F at the time of the storms. The temperature dropped steadily for a few thousand feet above ground level before sharply rising in the inversion layer between 3,000 and 4,000 feet. The air finally started steadily cooling off again above 4,000 feet. The inversion layer was so warm that it actually allowed air to start rising from the top of the layer all the way to the upper levels of the atmosphere, feeding the storms the instability they needed to produce heavy rain and lightning. The SKEW-T chart above also shows a tiny little slice of the atmosphere below freezing a few hundred feet above the surface, which explains how some of the precipitation fell as sleet. Sleet forms when a snowflake falls through a layer of warm air but doesn't completely melt before reentering subfreezing air. The ice crystals left behind in the newly-formed raindrop serve as the nucleus allowing the droplet to freeze into the ice pellets we know as sleet. If anyone wasn't aware that it was sleeting outside, they sure knew that it was thundering. The thunder was loud and it seemed like some of the cracks would never stop rumbling. The same inversion that allowed the thunderstorms to develop also helped make the thunder so loud. The sound of the thunder was amplified through "atmospheric ducting." The sudden change in temperature acted as a sort of barrier that reflected some of the sound waves back down toward the surface and caused it to echo across long distances. The echoing effect caused by the inversion allowed one crack of thunder to reverberate for much longer than normal, leading to that ultra-satisfying rolling thunder sound. This winter sure decided to go out with a bang. Two storms will bookend the United States with big disruptions to major cities along both the eastern and western coasts. 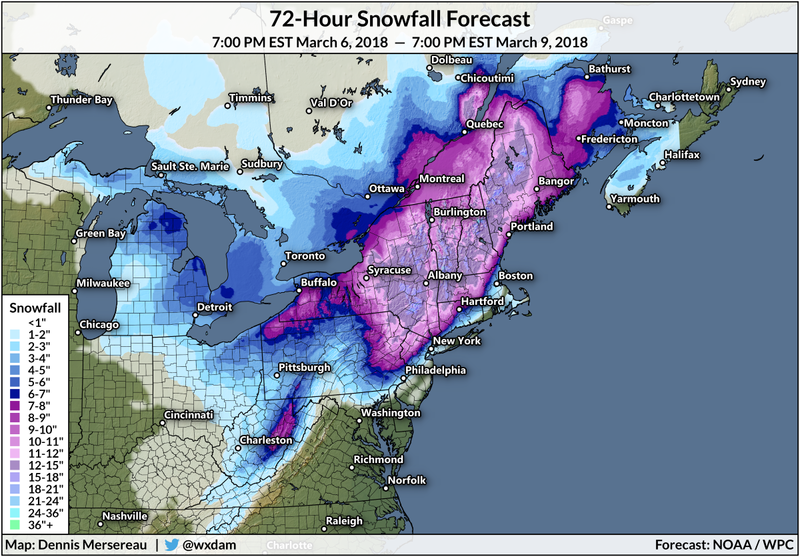 The fourth nor'easter this month looks like it'll bring significant snows to the Mid-Atlantic and Northeast to herald the start of astronomical spring. The extent of the heavy snow looks like it'll be farther south than the previous atmospheric cha-cha slide of snowstorms, finally giving Washington D.C. the snow it's missed all season. Meanwhile, on the other side of the country, a major storm system approaching California will give the Golden State some much needed rainfall. The rain will be heavy enough that flooding could be a serious issue in some communities. It's pretty rare to have four significant nor'easters in one month—let alone when that month is March—but here we are talking about more than a foot of snow on the first day of spring. Heavy snow will fall between Tuesday night and Thursday evening from the mountains of North Carolina through Maine. The heaviest snow looks like it'll fall in a large swath from Virginia to Massachusetts, but the amount and extent of the big totals will change as forecasters and models fine-tune the forecasts. 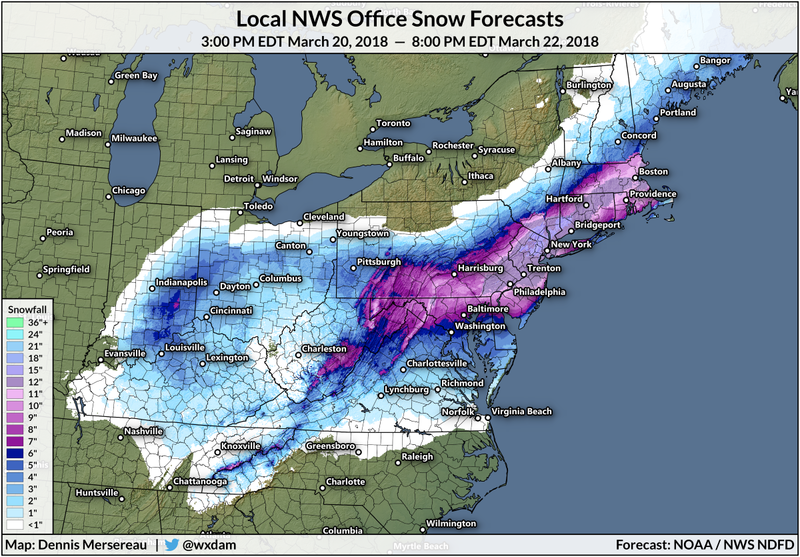 The above snowfall map shows all the different forecasts issued by individual National Weather Service offices as of 3:00 PM Eastern, giving you an overview of what each office thinks will happen in their regions. These maps usually look like a mismatched jigsaw puzzle during a big event like this, reflecting differing opinions between forecasters at different offices, but there seems to be tight agreement in the snowfall totals across the Mid-Atlantic and Northeast for this storm. It's worth noting that some private forecasts (like those issued by The Weather Channel and local news outlets) are coming in higher than what the National Weather Service is showing, especially on the southern extent of the heavy snowfall around Washington D.C. Any northward or southward change in the track of the storm will shift the axis of heavy snow accordingly. It's currently snowing around the Washington D.C. area right now, but don't be fooled—this isn't the storm yet. 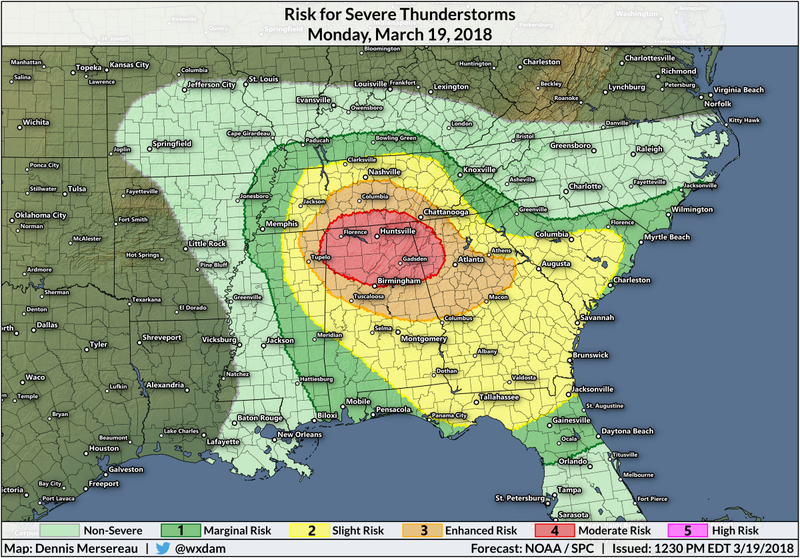 The precipitation right now is what's left of the storm system that brought destructive severe thunderstorms to parts of the southeast on Tuesday. The big snowstorm will develop tonight and work its way up the coast through Thursday. Rain should change over to snow in central North Carolina and Virginia late Tuesday night or early Wednesday morning. The snow will gradually increase in intensity up the Interstate 95 corridor on Wednesday and taper off on Wednesday night around D.C. The storm will move out of Philadelphia and New York city by Thursday morning, and it should finally end for coastal New England on Thursday evening. It's pretty late in the year for a snowstorm like this. Ian Livingston reports that it would be one of the largest snowstorms this late in the year on record in Washington D.C. Temperatures hovering within a few degrees of freezing for the duration of the event will help the snow stay heavy and wet, adding weight to trees and power lines and making it hard to shovel. The weight of the snow plus the force of gusty winds (possibly exceeding 40 MPH in spots) could lead to downed trees and power outages. Trees that have buds and leaves on them already will experience additional stress. The focus on eastern snow is often well-deserved given how many people live in areas that are easily ground to a halt when there's even a modest snowfall, but the West Coast deserves some love, too. 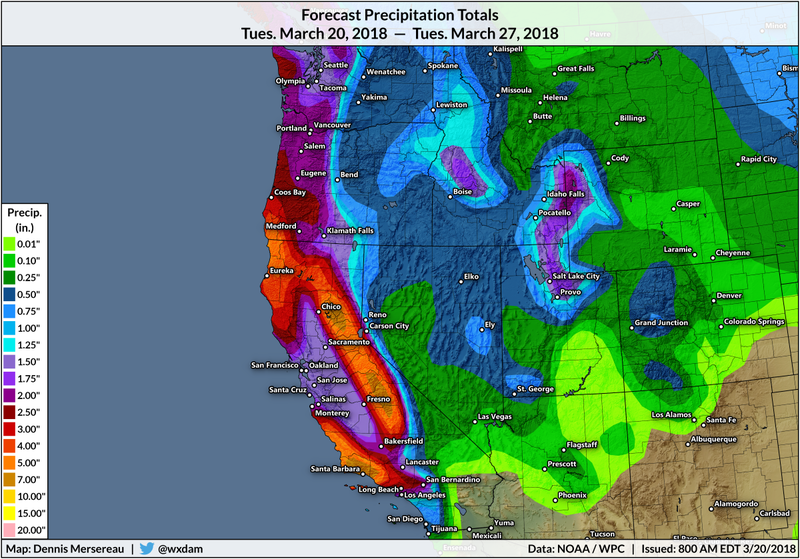 They haven't really had much weather over the past few months that warrants warning, but it looks like the first significant storm in a long time is about to roll across California and bring much-needed rain they haven't seen this winter. A large low-pressure system swirling in the eastern Pacific Ocean is tapping into deep tropical moisture as it heads toward California. 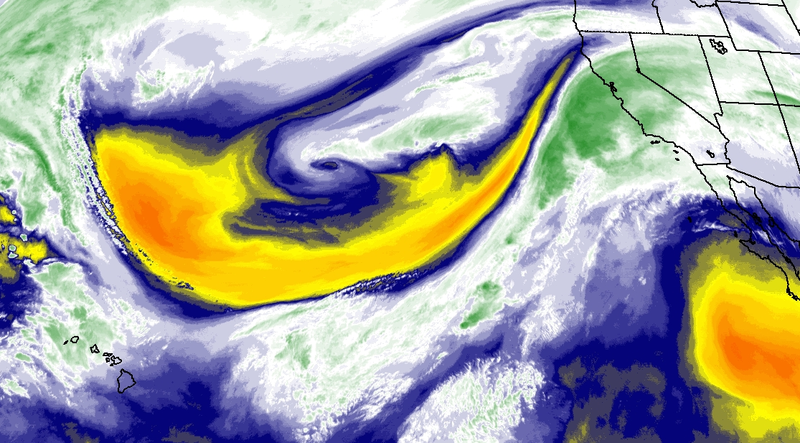 Water vapor imagery from this afternoon shows a deep plume of moisture heading toward California straight from Hawaii—this feature is often called the "Pineapple Express" in weather coverage. Heavy rain will begin on Tuesday night and continue on and off in waves over the next couple of days. The Weather Prediction Center is calling for at least an inch or more of rain for just about every part of California save for the deserts in the southeastern corner of the state. Los Angeles could see two inches of rain with much higher totals in the higher elevations between there and Monterrey. There's so much moisture associated with this system that some parts of the Sierras could see more than five feet of snow over the next couple of days. 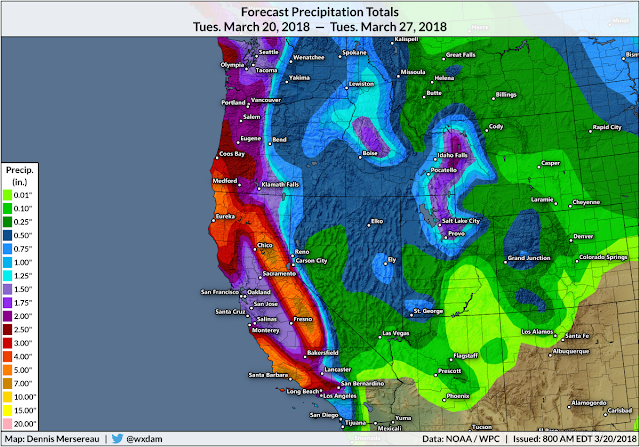 Northwestern California is also on track to see a few inches of rain from this storm, but the lack of drought or flooding concerns there makes this more of a dreary nuisance than an urgent problem. Flash flood watches are in effect for much of southern California and the Sierra Nevada foothills in anticipation of rain heavy enough to trigger flooding and mudslides. The threat for flooding and mudslides is greatest in areas with burn scars from recent wildfires. They're hurting for rain in some parts of California. The drought isn't nearly as bad as it was a few years ago, but much of the southern and central part of the state are in a moderate or a severe drought as of last week's drought monitor. Los Angeles has only seen about three inches of rain since the beginning of October, which is just a fraction of the amount they would typically see during the wet season. The city could see several months worth of rain in just a few days with this upcoming storm. 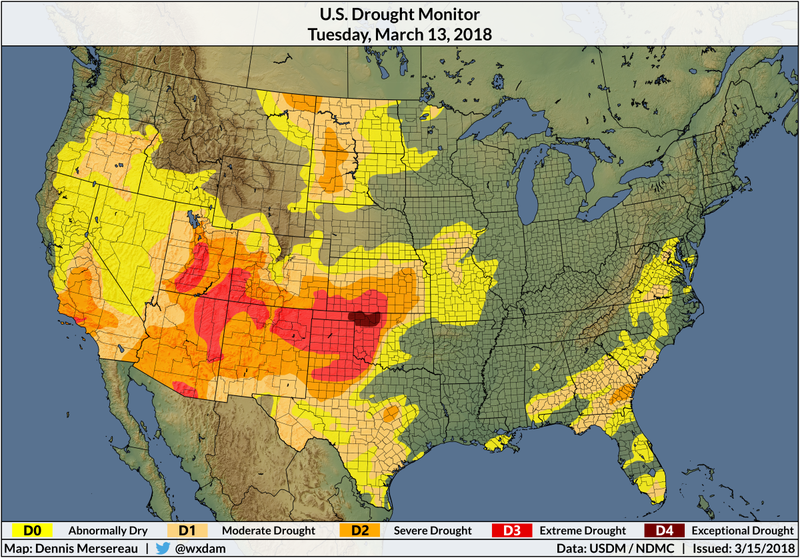 Elsewhere, the drought is getting worse across the Southwest and the Plains states as storm systems keep skirting around this region of the country. Oklahoma went from no drought conditions in the beginning of September to 42% of the state under a severe, exceptional, or extreme drought as of last week's update. You're not alone if you ever feel like there's a dome warding away all signs of snowy weather in your hometown. Lots of meteorologists and snow lovers take to social media every year to complain about the "snow bubble" or "snow dome" or any of the other frustrated terms we've come up with to complain about getting ripped off in the snow department. Some areas really do just miss out some winters; while snow is on the decline in some areas, the conspicuous lack of snow in one spot compared to nearby counties and states is often a fluke in the grand scheme of things. One of my favorite weathery complaints is that it seems like thunderstorms go out of their way to miss or hit certain areas. It didn't rain here in my central North Carolina county for a long time—once that streak ended, we got slammed by a parade of severe thunderstorms almost every week, a phenomenon I half-heartedly called #Rockinghaming. I wrote about this perceived thunderstorm bubble over at Mental Floss last year; the phenomenon is so common that there's an XKCD comic strip about it. The same can apply to snow. 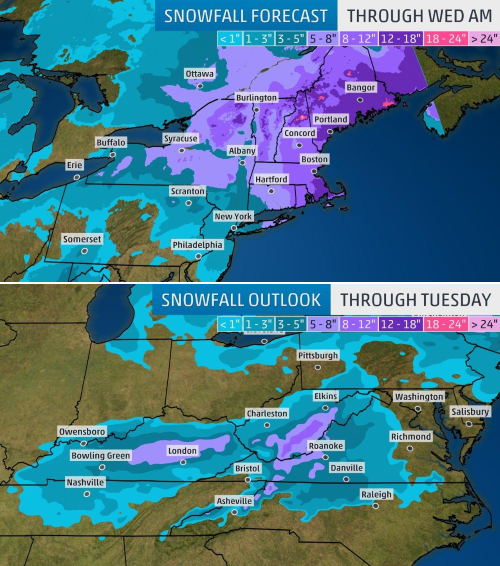 Two neighboring towns can see dramatically different snowfall totals from the same storm. The cutoff between feast and famine is so abrupt that it can almost seem like the satellite images and precipitation maps were faked. The fortunes of seasonal snowfall are driven by two major factors: storm tracks and storm characteristics. Every article written about a nor'easter that doesn't include some variation of the phrase "track is everything" is doing you a disservice. The intricate dance between temperatures, moisture, and lift can be so finicky that a small deviation in a storm's track from what's expected could have a dramatic effect on who sees what. Nobody knows that better this year than the Washington D.C. metro area. (Sorry to my friends there who find this painful to read.) 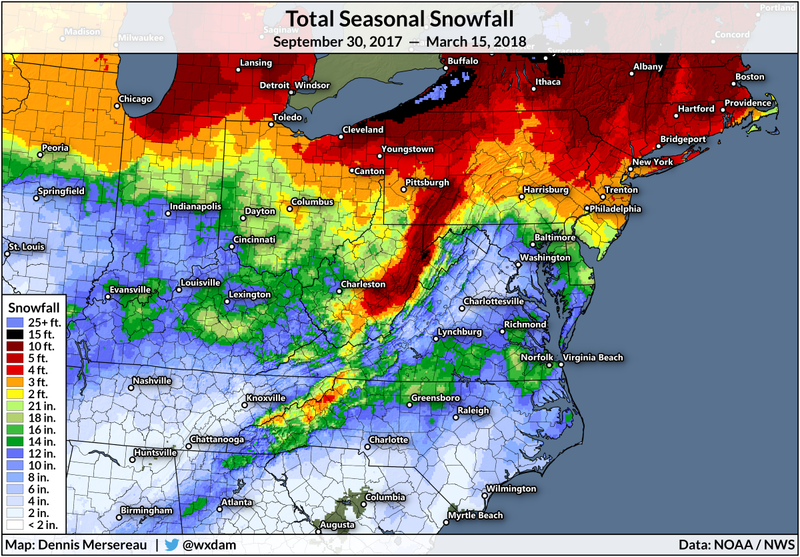 One look at the seasonal snowfall map shows a glaring omission in areas that decided to participate in the snowfest we've seen south of the Mason-Dixon line this season. I live just north of Greensboro, N.C., in the small city of Reidsville. We've gotten lucky here this year, measuring about 18 inches of snow this winter. That's well above our average of about seven inches each year. We accomplished this feat across three storms—one in December, one in January, and the storm at the beginning of this week. Our above-average snowfall wasn't a fluke. Look across almost the entire southern United States and you'll see a trend of unusually high snowfall totals. The accumulating snow even reached the Florida panhandle. Mobile, Alabama, saw just over an inch of snow this winter. Communities south of Corpus Christi, Texas, saw more than half a foot of snow, one of the biggest storms ever recorded in that part of the country. Washington's National Airport has only recorded 3.7 inches of snow this winter. Dulles Airport off to the west has only seen 6.6 inches of snow, which is around a third of what they see in an average season. Compare that to Baton Rouge, Louisiana—you know, that ol' icebox—where they've seen a cool four inches of snow this season. Jackson, Mississippi has seen nearly six inches of snow, Atlanta nearly five, Virginia's capital city just over ten, and even more than double D.C.'s total down in Raleigh, N.C. The most noticeable hole in the seasonal snow map above is in the middle of the United States. The lack of snow in the center of the country is a result of the dominant weather patterns across North America this winter. Dallas has only seen a trace of snow so far. Oklahoma City's paltry dusting is far below their seasonal average of seven inches. St. Louis and Kansas City have seen less than half of what they should in a normal winter. Temperatures have been near average for the past couple of months in these areas. However, high pressure has dominated the center of the country for most of the season, deflecting any real chances at winter storms and keeping those that did come through mostly rain or ice. But why has the atmosphere been such an anti-dendrite in the Mid-Atlantic this year? It's the storm tracks. The storms that rolled toward the East Coast never took the right track to hit D.C. The storm tracks this year have missed the D.C. area to the south, giving towns from Texas to Florida and beyond rare snow days, to the east as nor'easters skirted a little too far off the coast, and to the north in Pennsylvania. 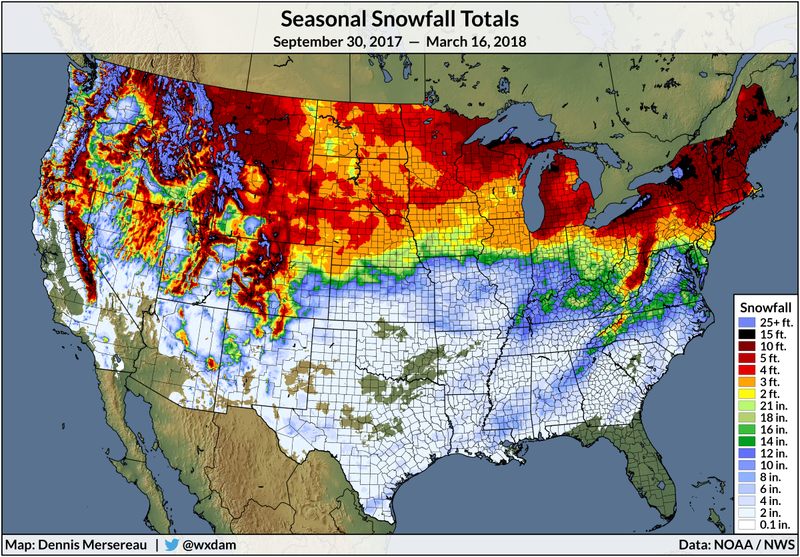 The pattern of snowfall totals this year almost resembles a snow shadow with the Appalachian Mountains wringing out all the moisture before any energy can deliver it farther east. See that stripe of lower snowfall totals through central Massachusetts? That's not a data error. While the area in question lies in the Connecticut River valley, lower than its surroundings to the east and west, the snow bands really did set up in such a way that towns like Amherst barely had enough to shovel while towns just to the east and west got clocked with more than a foot of snow. 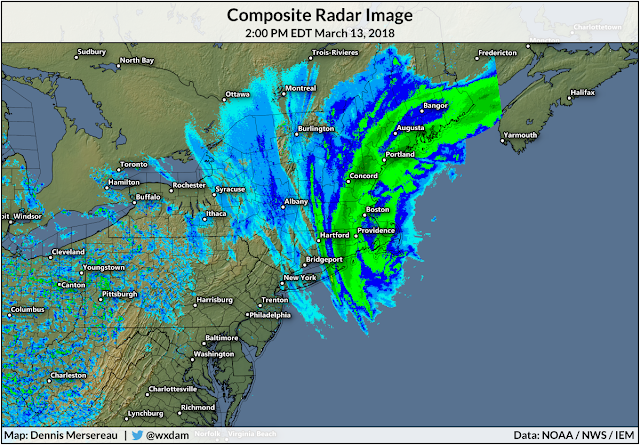 The intense bands of snow on the northwest side of a nor'easter form in what's known as the deformation zone. The deformation zone is part of the storm where upper-level winds collide; this zone is the classic "comma head" that makes these storms so beautiful on satellite imagery. These winds fan out laterally and create enhanced lift in the atmosphere. This lift leads to the intense bands of snow that can bury towns in feet of snow. 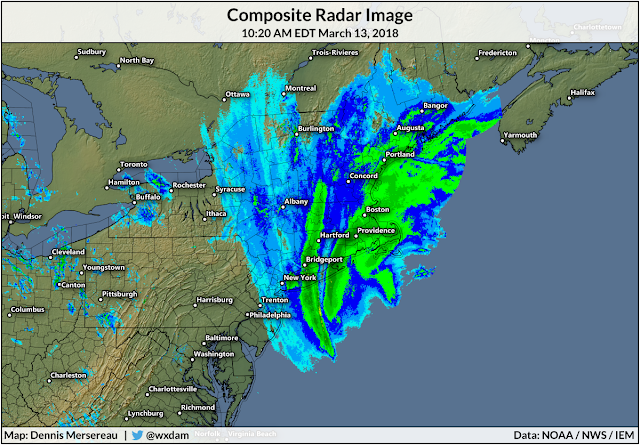 Sometimes you see one dominant band of snow and sometimes it comes together as multiple strong bands. The storm on March 13 was one of the latter scenarios. 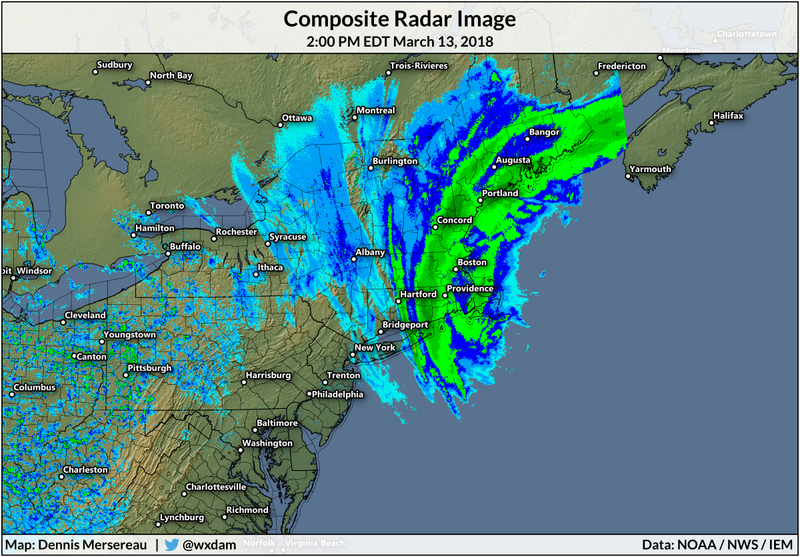 The end result was a remarkable hole in snowfall totals in central Massachusetts that only measured a dozen or so miles wide, all while towns on either side get smacked by the intense bands. There are a few more chances of snow before the warmth finally wins out against the stubborn winter air. It's far too early to tell, but the pattern looks favorable for another East Coast storm, and hey, D.C. could finally get its respectable snow after all. Stranger things have happened. Archaeologists will soon be able to tell time by observing the layers in the snowpack that's developed across the northeastern United States this month. 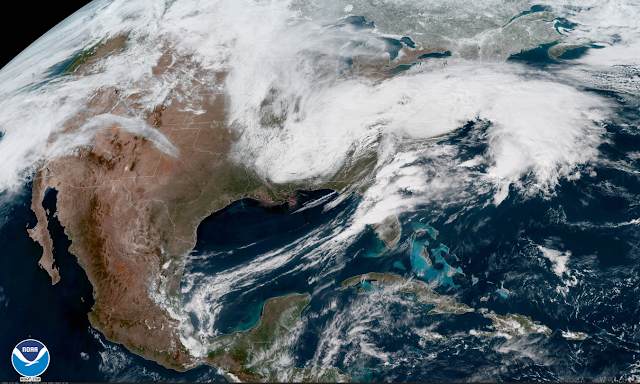 The seeds of yet another nor'easter—the third in the past two weeks, if you're keeping count—are developing over the Ohio Valley and off the coast of the southeast this evening. The newly-minted storm will eventually hook toward New England on Monday night, where some folks may see more than a foot of snow by Wednesday morning. The current pattern dictating North America's weather over the past few weeks has allowed nor'easters to return with the weekly reliability of a bad sitcom. The storm coming up on Monday and Tuesday will be the third major winter storm in two weeks. This latest storm won't be as widely impactful as the previous two, but the folks who get heavy snow will have plenty of it come Wednesday morning. Snow will fall in two phases: the first on Sunday night and Monday in the Mid-Atlantic, and the second batch comes while the nor'easter revs up in classic fashion off the coast. The first batch of snow is already falling over the Ohio Valley this evening; some parts of Kentucky are under winter storm warnings for up to eight inches of snow. How much snow will your town get? Pick a forecast and have fun! The uncertainty in the track of the storm is leading to some interesting and diverging forecasts. Most forecasts for most spots are roughly the same, but you can see the uncertainty in the storm's track based on the forecasts for some cities. I can understand the frustration of folks who don't follow weather as a hobby as they try to grapple with the idea of forecast uncertainty. My town in North Carolina is currently expecting anywhere between zero and five inches of snow depending on whose forecast you read. A more southerly track on Sunday night and Monday could expose parts of Virginia and North Carolina to heavier snow and greater accumulations than what's currently forecast. A closer track to the coast on Monday night and Tuesday could bring the heavier snow closer inland, placing more of the Northeast in the path of heavy snow than currently forecast. 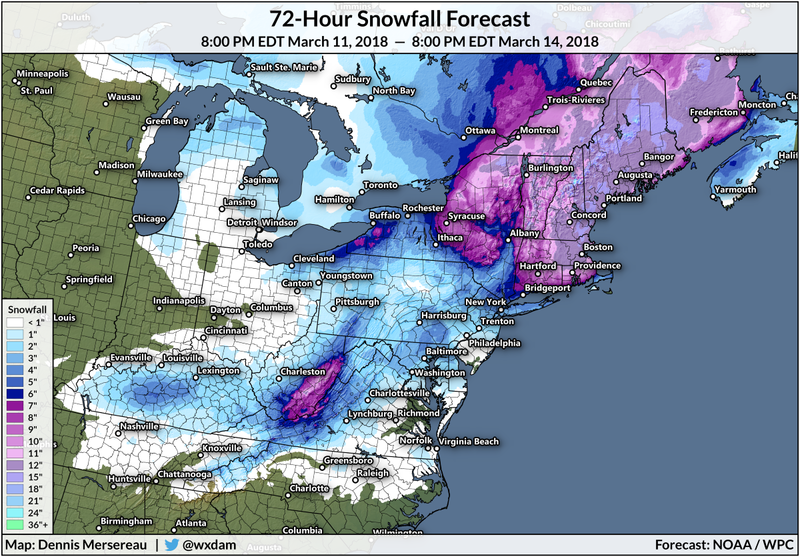 The latest forecast from the Weather Prediction Center shows a slug of snow starting in Kentucky this evening as the storm makes its way toward the Mid-Atlantic. Rain will change over to snow north of the storm's path, likely subjecting the Appalachians and Piedmont of Virginia and North Carolina to a quick coating on Monday. Once the nor'easter blooms off the coast on Monday night and Tuesday, heavy snow bands on the northwest side of the storm will rake across New England and drop more than a foot of snow in many spots. Some of these towns still have a foot or more of snow on the ground from last week's storm. The Weather Channel's forecast is more bullish than the Weather Prediction Center's, showing anywhere from one to five inches of snow across north-central North Carolina, and one to three inches of snow in eastern New Jersey and New York City. Much of coastal New England will see a foot, with some spots coming in with more than a foot-and-a-half. 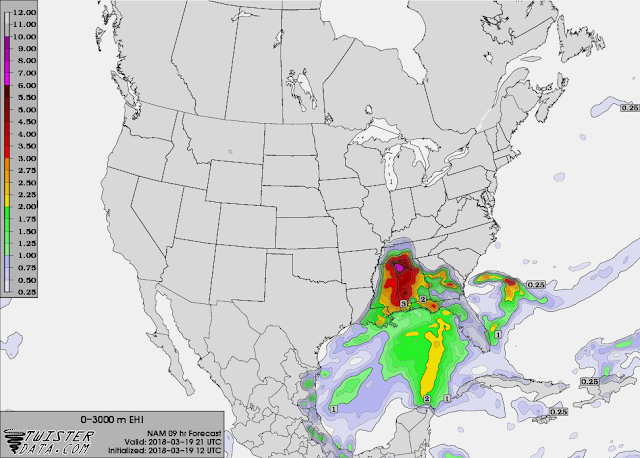 Despite its taste for internet dramatics and endless reality shows on television, the Atlanta-based weather behemoth has a darn good track record when it comes to forecast accuracy. The way WeatherBug sees it, a lot of people are going to get 1 to 5 of snow (inches? millimeters? corgi-lengths?) and New England is getting ready to see...dark blue? Where's the dark blue on the scale? What are the units? I have no idea what's going on here, but they're showing a lot (maybe?) in North Carolina and Virginia, and they're giving all the big eastern cities an amount of snow. We're not sure what amount that would be, but it's certainly an amount. 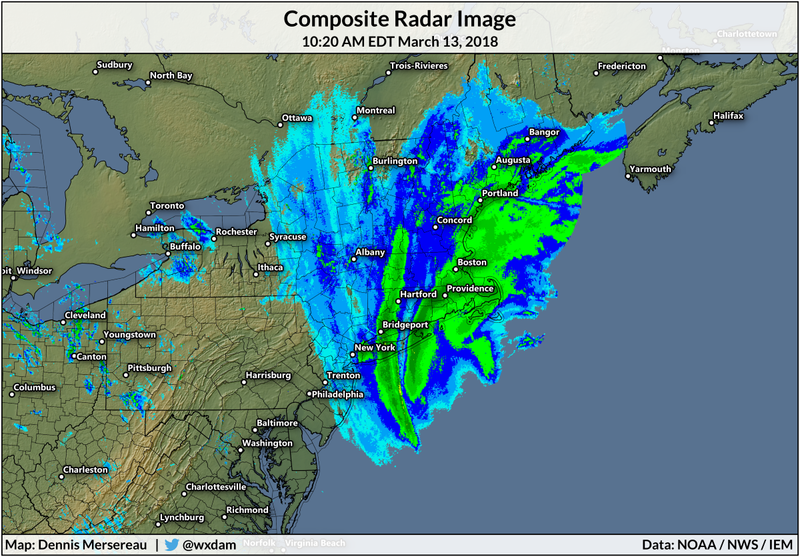 AccuWeather's forecast on Sunday afternoon showed the heaviest snow in the Mid-Atlantic falling in the Appalachian Mountains with lighter totals extending out into the Piedmont toward Richmond, Virginia. Up in New England, the heaviest snow would fall in New Hampshire and Maine. 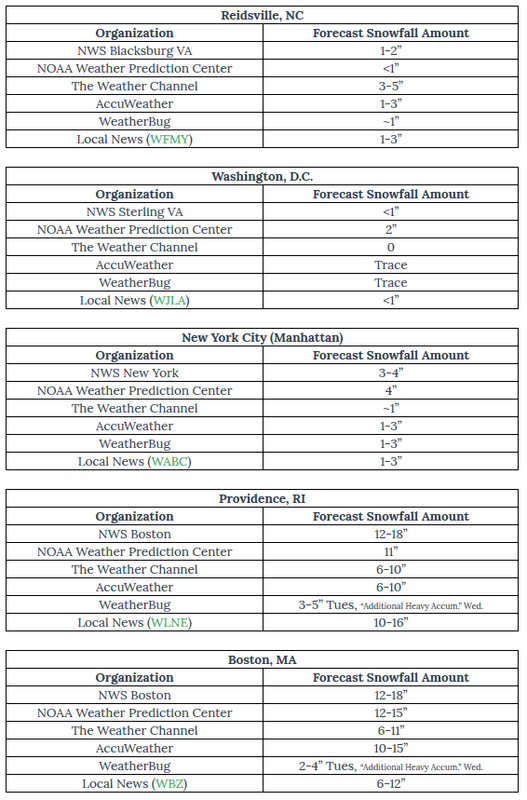 Here are some select forecasts for cities on the East Coast as we get closer to the event. This is what you would have seen had you checked the weather around 9:00 PM Eastern on Sunday night. Some of the forecasts are in line with each other, but they do diverge on amounts. Boston and Providence could see anywhere between 6 and 18 inches of snow depending on whose forecast you look at. New York City could between less than an inch and four inches. The difference between accumulations is often just splitting hairs—three and five inches of snow are roughly the same in terms of impacts—but a light coating of snow can pose a significant risk in rush hour traffic compared to an inch or two that gives you a chance at some traction. On the other end of the scale, 6-10" is a solid snowstorm but vehicles can easily become stranded once you enter double-digit snows. Either way, it looks like the big winners (a subjective term, of course) will be the Boston metro area, eastern New Hampshire, and the bulk of populated Maine. When it comes to significant rush hour issues, keep an eye on North Carolina, Virginia, and the Washington D.C. area. It doesn't take much snow to trigger mass panic, and if they're not calling for much tonight and there is accumulating snow tomorrow, lots of people will venture to work only to find themselves driving home in the snow and ice. This nor'easter will be more conventional than last week's windstorm, but it'll hold its own when it comes to impacts. Making the situation worse is that the forecast is both high-stakes—due to the potentially disruptive effects in the big cities—and highly uncertain due to the nature of the storm. 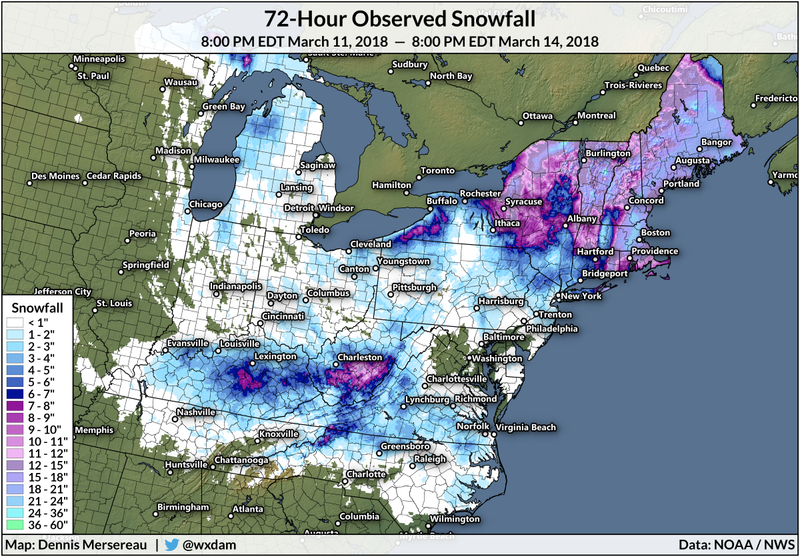 While last week's nor'easter did produce heavy snow across interior parts of the Northeast (including many areas expecting more heavy snow this week), the big story of last week's nor'easter was its relentless winds. Dulles Airport recorded a peak wind gust of 71 MPH during the storm. Many locations in the Mid-Atlantic and Northeast saw wind gusts strong enough to knock out power to more than a million customers, trigger destructive coastal flooding, and the gusts even led to the demise of one of Interstate 95's most memorable...landmarks. The headline for this storm will be heavy snow. Current forecasts show the nor'easter ramping up off the Delmarva Peninsula on Tuesday night. The storm will quickly get its act together as an upper-level trough and a jet streak (an area of stronger winds within the jet stream) move off the coast and align to help the storm quickly strengthen. Heavy snow along and west of Interstate 95, with a sharp cutoff in totals. Flight/train cancellations and roads nearly impassable in the heaviest bands. Heavy rain at the coast possibly switching over to snow late in the storm. The weight of the snow and gusty winds will stress trees that took a beating last week, leading to the potential for more power outages and damage. The most important thing to know about nor'easters is that the track is crucial in who sees what. A tiny nudge to the east or the west in a storm's path could dramatically change a town's snowy fortunes. Too close to land and the heavy snow stays inland and areas closer to the coast are a wintry mix or cold, dreary rain. Too far from shore and the snow stays along the immediate coast. This atmospheric high-wire act often leaves the megalopolis—the string of cities along Interstate 95 between Washington and Boston—teetering between precipitation types. That's stressful to deal with when millions of people are expecting perfect forecasts and you may not be able to tell them with confidence what kind of precipitation they'll see and how much of it they can expect. Wednesday's storm is forecast to ride right along the coast, which pushes the heavy snow inland and keeps the immediate coast rain for most of the storm. The likely track of the storm will put the deepest accumulations just to the west of I-95, but golly is it going to be a close one for cities like Philadelphia, New York, and Boston. The current forecast from the Weather Prediction Center (mapped by yours truly above) shows that the agency's most likely scenario (50th percentile) was that the heaviest snow would fall just a few miles west of the major cities from Philly to Boston. This is likely going to be a big storm for interior areas, with much of upstate New York and New England seeing a foot or more by the end of the storm. There's going to be a sharp gradient in snowfall totals wherever the heaviest bands set up. Neighboring counties (even neighboring towns) could see double-digit differences in accumulation. Now, that's just the WPC's 50th-percentile (most likely) forecast from early this morning. The situation gets much more interesting if you go a step lower and start reading forecasts from individual NWS offices, each of which has their own local experts that produce their own forecasts. 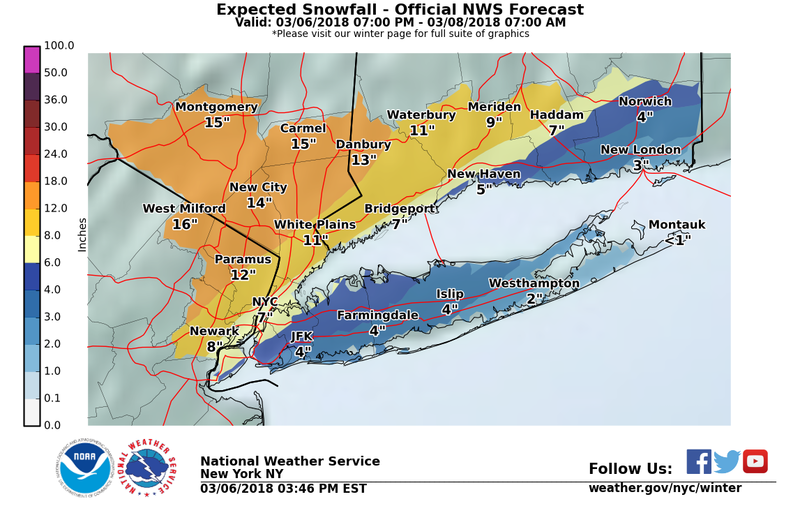 The official forecast from NWS New York (pictured above) shows the heavy snow falling closer to the coast, plastering New York City with more than half a foot of snow and its far northern suburbs coming in with more than a foot. That's a pretty big difference from the most likely WPC forecast issued this morning. It's a similar situation up in Boston where the forecast is shifting by leaps and bounds depending on what town you're driving through. 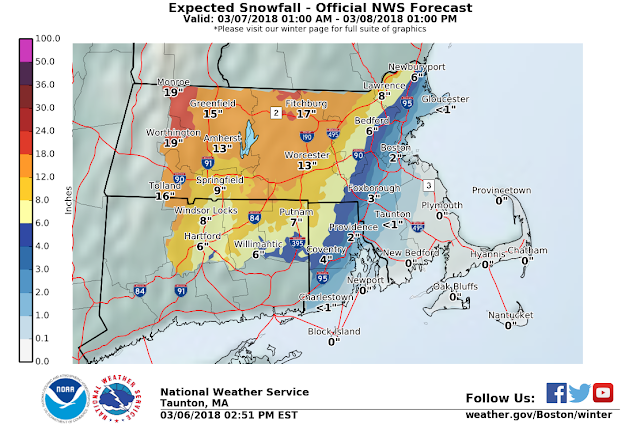 The original forecast issued this morning called for up to 8" of snow in Boston proper while towns like Taunton and Foxborough, separated by 14 miles, had a nine-inch spread in snow totals between them. The latest forecast from NWS Boston shows the rain/snow line pushed farther inland, keeping Boston's snow on the inconvenient side and putting the stress of wondering if you'll get plastered or annoyed squarely on inland towns. An eastward jog in the storm's track could bring the forecast for heavier snows closer to the coast again. The track of the storm is responsible for all of this uncertainty. The storm will be close enough to the coast that just a tiny intrusion of warm air at or above the surface could provide towns close to the shore with much lower snowfall totals than they would see if the storm scooted a bit farther off the coast and the atmosphere was uniformly subfreezing from top to bottom. THE TRACK OF THE SURFACE LOW IS OF GREAT IMPORTANCE TO THE SNOW IMPACTS AS TIGHT GRADIENTS IN SNOWFALL AMOUNTS LEAD TO SIGNIFICANT SNOWFALL AMOUNT ADJUSTMENTS POSSIBLE IN THE PRECIP TYPE TRANSITION ZONE IN EASTERN NJ/LONG ISLAND/SOUTHEAST CT/RI/BOSTON AREA. Precipitation will be light to start, and this light intensity may allow parts of the New York City metro area to start off as rain, but as the precipitation becomes steadier and heavier, cooling the column, a change over to all snow is expected late tonight. The latter discussion refers to a process known as evaporative cooling—liquid absorbs latent heat when it evaporates, which helps cool the air. You've probably heard the term in the context of air conditioners or even reading about how microbursts form, but evaporative cooling can help change rain over to snow in winter storms. You might see talk on social media about winter storm "producing its own cold air," and this is the process they're usually hoping will happen. It can be frustrating to hear something like this when we live in an era where we can predict the weather with such accuracy and precision, but some things really do come down to waiting and watching. Local forecasters expect the heaviest snow to develop right over the big cities and unload off to the west, but the storm's finicky track and unexpected intrusions of warm air above the surface can change things in a hurry. The best thing to do right now is to expect the worst and hope for the best. It's going to be a close one no matter which way the precipitation falls. It's the wonder of geography and meteorology that some of the country's biggest cities fall right where the rain/snow line usually sets up shop. Watch out for power outages. The term "heavy snow" doesn't only apply to how fast it falls—for many, it's going to be a wet snow that will be hard to shovel and even harder on trees and power lines. The weight of the snow and additional force of more gusty winds will add stress to trees that were stressed-out last week (weren't we all) in the gusty winds. This could lead to more power outages, which is something you don't want when it's going to drop down into the 20s at night. Just like last week, make sure you're prepared to deal with power outages. Keep your phones and devices charged and keep a few actual flashlights (not just the feature on your cell phone) juiced up and ready to go just in case the lights go out. The bark is sometimes worse than the bite in nor'easters. The nor'easter set to form off the East Coast tonight will not be one of those storms. If you don't know the storm is coming, you'll hear it soon enough. This storm will crank out some strong winds across the Ohio Valley, Mid-Atlantic, and the Northeast, with gusts possibly reaching 70 mph in spots between Thursday night and Saturday afternoon. This will be a large storm with widespread effects. We'll see a little bit of everything from this system: snow, rain, flooding, wind, you name it. But even though it's raining just about everywhere on the East Coast right now and some folks will see more than a foot of heavy, wet snow, it's the wind that's going to cause the most problems. Wind advisories are in effect from central Alabama to the coast of Maine and high wind warnings are in effect from western North Carolina through Massachusetts. 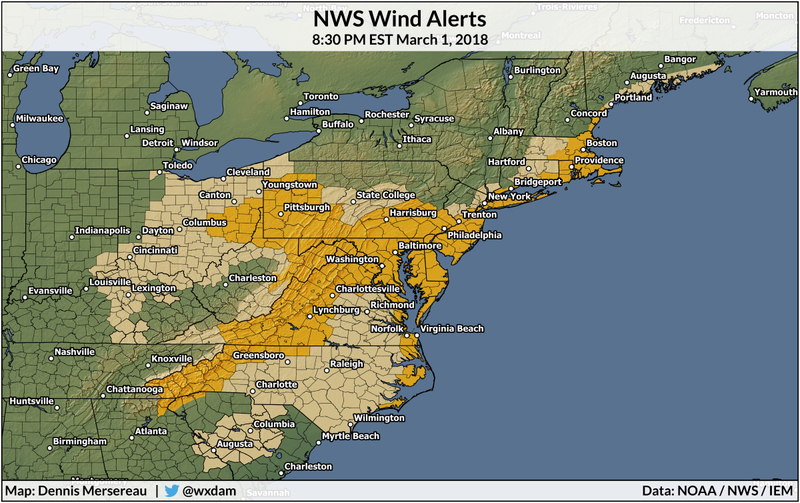 Winds could gust higher than 60 MPH in the warning areas, with a particular focus on the Appalachian Mountains, the Washington/Baltimore metro areas, and the New England coast. Surface analysis at 3:00 PM EST March 1, 2018. The winds are already kicking in the Ohio Valley. Cincinnati Airport (KCVG) measured sustained winds around 30 MPH and gusts near 45 MPH around 3:00 PM Eastern on Thursday. The gusty winds will continue moving east and strengthen on Thursday night as the low-pressure system makes its way toward the coast and reorganizes into the impending nor'easter. Why is it going to get so windy? The first issue is that the nor'easter will undergo bombogenesis over the next 24 hours. Bombogenesis describes the rapid deepening of a low-pressure systems minimum air pressure. Forecasts show the low's central pressure dipping below 976 mb by Friday morning. That's a decent pressure for a nor'easter—even deeper than some weak hurricanes. Unlike the structure of a tropical storm or hurricane, which keeps the bulk of its energy bottled-up in one small part of the storm, extratropical cyclones like nor'easters spread out their energy. This storm isn't going to be a problem for one or two states. It's a problem for almost a quarter of the country. The storm's forecast strength alone is impressive enough, but a strong high-pressure system will build over the Midwest at the same time as the nor'easter strengthens. This combination of a strong low and a strong high in relatively close quarters will result in a tight pressure gradient that causes winds to crank up for a period on Friday and Saturday. The above chart shows what the GFS model thinks winds (in kts) will look like a few thousand feet above the ground around 7:00 AM Eastern on Friday morning. 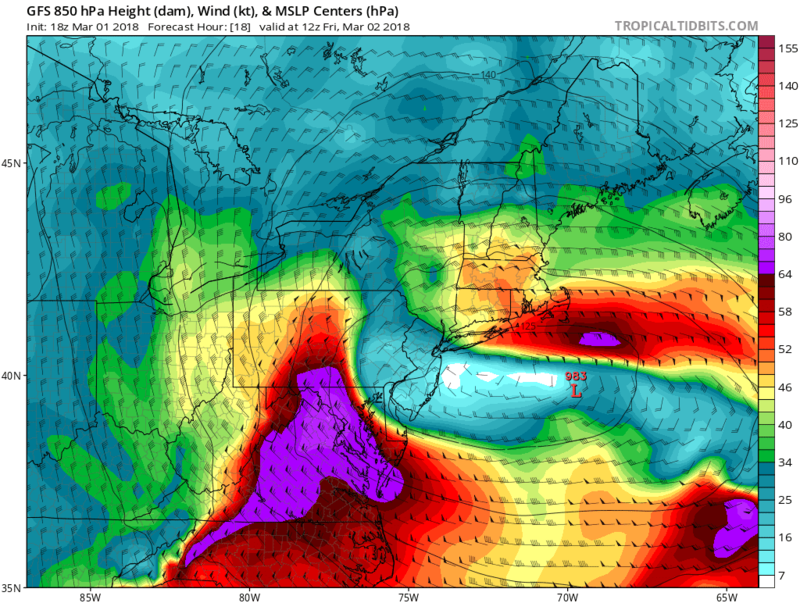 The wind is going to be ripping just above the surface over the Mid-Atlantic, and it won't take much to translate that energy down to the ground. The core of the intense winds will shift its focus to New England on Friday evening and Saturday. The Crayola explosion above is the National Weather Service's forecast wind gusts for 5:00 PM EST on Friday, March 2, 2018. (The values on the map are in MPH even though the caption says KTS.) It's going to be so windy in the Mid-Atlantic and Northeast that smaller folks and kids may have trouble walking around outdoors. Wind damage is likely from this storm. Downed trees will cause damage to power lines, buildings, and vehicles. Debris will make some roads impassable for a time during the storm. Recent (and ongoing) rainfall has softened the soil and will make trees more susceptible to falling over. Widespread power outages are likely in areas expecting the highest winds. 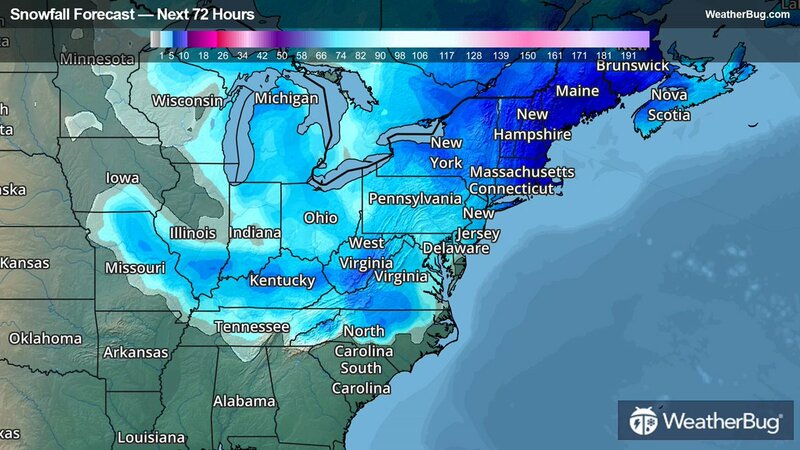 A large number of flights will be cancelled—causing a ripple effect of cancellations and delays nationwide—as winds will exceed maximum levels that allow for safe flight at many of the country's eastern hubs. Another ugly side effect of this wind is that it will send a storm surge into the coast. The surge will act much like it does during a tropical cyclone—the strong winds will push up to three feet of seawater into coastal communities at high tide from North Carolina to Maine, with a surge of up to five feet possible in parts of Massachusetts where the coast is perpendicular to the direction of the strongest winds. This will lead to flooding in communities right on the shore. Charge your mobile devices! Keep your cell phone as close to a full charge as possible. If you have a portable power/battery pack for your phone, keep that charged, too. Power outages are no fun, but they're even less fun if you can't communicate with anyone. If you have furniture, pottery, or knick knacks on your deck, balcony, or porch that you want to keep on your deck, balcony, or porch, don't forget to secure them or bring them inside tonight before you go to sleep. The wind could knock them around and break them—or worse, break something else. Try to avoid walking or parking beneath tall trees or trees with limbs hanging over sidewalks, parking spots, and roadways. Use extra care walking around in downtown areas. Debris that blows off of tall buildings, balconies, or construction sites can hit the street at a dangerous velocity. Aside from the winds, heavy rain and snow will be a lesser threat on Friday and Saturday. A few inches of rain could push streams above their banks and overwhelm drainage systems, covering roadways and possibly threatening buildings in flood zones. The storm will produce a heavy, sticky snow in the Northeast from Pennsylvania northward to the Canadian border. Forecasters expect up to a foot of snow in much of upstate New York, with totals exceeding one foot in western New York and in the Catskills. The combination of wet snow and high winds could increase the risk for downed trees and power outages in areas that receive significant accumulations.